In 1974 Federico Faggin left Intel after working on the 8-bit 8080 processor. He formed a company called ZiLOG and developed a much improved version of the 8080 called the Z80. It was released in 1976 after only 18 months of design. The Z80 was faster, cheaper, and simpler to build around then the 8080 and enjoyed extremely wide use. ZiLOG designed the CPU but it was marketed differently then most at the time. Any company could purchase a license to the design, and build them royalty free. They were also free to do with the design as they pleased. This resulted in dozens of companies making clones/versions of it. The Soviets made unlicensed copies as well. In fact other companies made more Z80s then ZiLOG did themselves. The Z80 was not the only processor that ZiLOG made. Some of the processors/part numbering can be a bit confusing so we’ll look at each family and part that Zilog made up through 1985. After 1985 CMOS designs came out as well as dozens of variations. We just want to look at the first ten years of ZiLOG. The Z80 itself was, of course, similar to the 8080 but single voltage, and only required a single clock phase. It was available in speeds of 2.5-8MHz. ZiLOG also made a low-power version known as the Z80L (Z8300) that ran from 1-2.5MHz. That’s really all there was to the Z80 family up through 1985. ZiLOG released a microcontroller in 1979 called the Z8. The Z8 is NOT compatible with the Z80, nor is its hardware at all similar to the Z80. Its instruction set is similar, and assembly architecture is similar to ease programming for it but hardware wise it is a completely different processor. The Z8 part numbering is typically formatted as Z86xx. Several different versions were made. The Z8601 and Z8603 were 2K ROM versions. a Z8602 was detailed in datasheets (1982) but apparently never released. The part number was later used (1993) as a Keyboard controller based on the Z8. The Z8601 was a MASK ROM and the Z8603 a Protopack for development. It had a ‘piggyback’ socket for an EPROM. The Z8611, Z8612, and Z8613 were essentially the same as the Z860x parts but with 4K of ROM. The Z8611 was for mass production (with a 4K Mask ROM), the Z8612 was a 64 pin package with an externa memory interface, and the Z8613 was again, a Protopack. The Z8681 and Z8682 were the ROMLess versions (all program contents had to be stored off chip). For most things these 2 chips are the same, however if you look at them you notice one difference. The Z8682 can only address 62k of memory while the Z8681 can do an entire 64k. Further research shows that the Z8682 must be run in Test Mode to function. This is because the Z8682 is actually a Z8601 with the onboard 2K ROM disabled. Thus addresses start at 2K leaving only 62K available. This allowed ZiLOG to sell Z8601 dies that had faulty ROMs. This practice is still common today with multicore CPUs and/or various cache sizes. ZiLOG also released the Z8000 in 1979. This was ZiLOGs attempt at a 16-bit CPU. It was not compatible with nor based on the Z80. Being it was released the same time as the Intel 8086 and Motorola MC68000 as well as the National 32K and a few other competing designs, it did not do very well. It nonetheless was used in several arcade games, and military applications and saw use well into the 90’s. 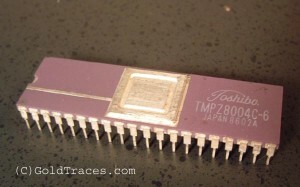 The Z8000 was made in two main versions: The higher end Z8001 which, by use of segmentation, could address up to 8Mb of memory, and the Z8002 which could only address 64k. Memory segmentation works by essentially having 2 address buses. First a 7-bit segment is selected (so 128 segments possible) then the word is selected with a 16 bit address. This required an extra 7 pins and thus the Z8001 came in a 48 pin DIP. Virtual memory versions were also made. The Z8003 and the Z8004. These were essentially the same but added abort capability as well as Test and Set status flags to support virtual memory. 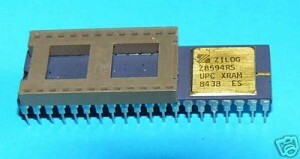 ZiLOG also made a set of UPC’s (Universal Peripheral Controllers) based on the Z8 that could interface to the Z8000 or other processors of the time. These were similar to the idea of the Intel 8041 and 8042 devices. The 8041/2 however was much more successful and completely dominated the market (as it still does today for many such basic tasks as keyboard controllers). ZiLOG made the Z8090-Z8094 and the Z8590-Z8594. The Z809x were for multiplexed CPU’s such as the Z8000 and the Z859x were for non-multiplexed CPU’s such as the Z80. There is also a reference to a Z8034 UPC in various datasheets but I have not been able to find one, again it may be a non-produced part.